You'll flip over our two sided ball marker coins! 1-1/2" magnetic coin with two 7/8" removable die struck ball markers on either side. 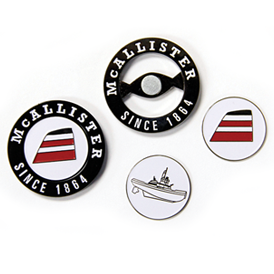 This magnetic coin with two removable 7/8" ball markers is die struck with two custom designs. Choice of nickel, black nickel or antique brass plating. Up to four PMS matched soft enamel colors. Different design on each ball marker. Outer ring can be laser engraved on CZBM1 or enamel color filled with CZBM2 Individually bubble packed. For gold plating or antique silver or gold plating, please add 20%. For 2 color plating, add 40%. For additional soft enamel colors, add .18(C) per color. Pre-Production sample: 100.00(G) plus die charge. Sample charge refundable with order placed. Add 2 weeks to deliver time. Overnight shipping charges apply.